Share D-Link DWP-157 21mbps internet connection through WIFI..
Share D-Link DWP-157 21mbps internet connection through WiFi. D-Link DWP 157 Internet data cards (modem) best in the price around Rs. 1000. With the data card, you can easily use any GSM 2G and 3G normal sim card. But it has a disadvantage that you can not share your D-Link DWP 157 internet data connection with other devices like- smartphone (Mobiles), tablets & other computers. Because it does not have soft WiFi option. 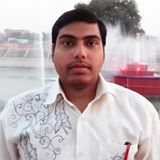 If you try to share some way, then you will face network related problems. But with this device also has another way, by which you can share your data card Internet wirelessly. When the D-Link data card drivers are installed, then an additional device adapter automatically created in the Network Connection name is- “Mobile Broadband Connection”. That we do not use or do not know how to use. Mobile Broadband is a facility, which is provided by many internet service providers. By dialing through this adapter you can directly connect to the internet. If your PC or Laptop has WIFI hotspot or WIFI sharing feature then you can easily share your D-Link DWP 157 internet via your WIFI hotspot. Note: – Disconnect your D-Link internet before doing this. Open run dialog box by pressing “Windows logo + R” key together in keyboard then type ” ncpa.cpl ” without quotes in the run dialog box & then press OK. Right Click on the network icon in notification icon area & then choose Open Network and Sharing Center option. In Network and Sharing Center, right click on Change adapter settings option from the left pane. Now In Network Connection, you’ll see the two D-Link networks connection. The first Mobile Broadband Connection and other USBDEVICE. The USB Device works as D-Link default dialer. That means, when you connect to the Internet from D-Link Connection Manager, the Internet connectivity will be via the D-Link USBDevice. But if you will share your internet via D-link default USB device connection, so it will not function correctly, continuously connectivity problem will appear. So if you would like to share the D-Link DWP 157 data card Internet through WiFi, so here you will have access to Mobile Broadband Connection adapter. 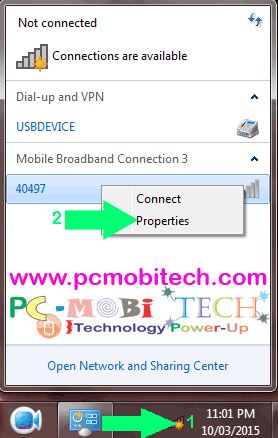 If you want to share your D-Link DWP 157 data card internet then right click on Mobile Broadband Connection & then choose Properties from context menu. Mobile Broadband Connection properties dialog box appear. Click on Sharing Tab. Now in Sharing tab tick the checkbox Allow other network Users to connect through this Computer’s Internet connection. Choose your home networking connection as Wireless Network Connection or something else from the drop-down list. after this click on OK to save the settings. 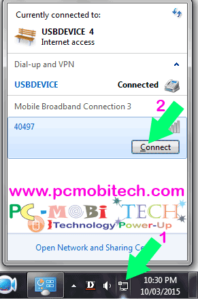 To use the Mobile broadband connection adapter, You will need to fill the Internet service provider’s APN, in mobile broadband adapter properties. 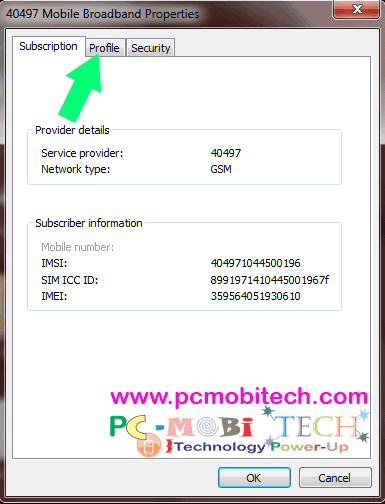 Click on the network icon in the notification area, right-click on Mobile broadband connection & then choose Properties. Mobile Broadband Properties dialog box appears, Click on profile tab. In profile tab Enter APN ( Access Point Name) in the box, It depends on your sim (BSNL, Airtel, Idea, Vodafone, Telenor, Tata Docomo, Reliance) etc. Please ask your customer care for APN. for example, if you are using Airtel 2G or 3G then default APN is airtelgprs . After filling the APN press OK to save settings. 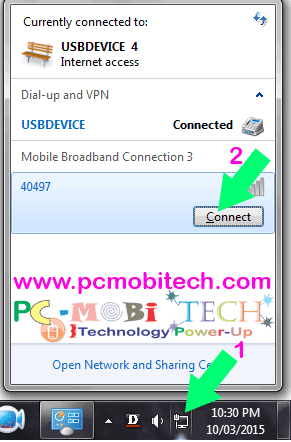 When you want to connect to the internet click on the network icon on notification area then click on connect button under Mobile Broadband Connection. When you want to share your internet with other devices, then to connect to the Internet, only dial from mobile broadband connection adapter. please don’t use your D-Link application & default dial-up adapter. 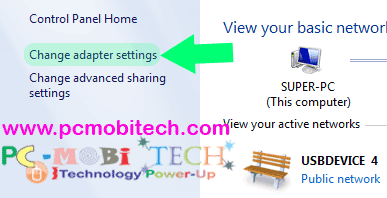 Now you can share your internet with other devices via WIFI Hotspot or WIFI Sharing feature.